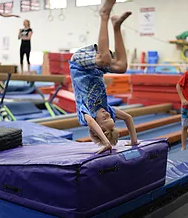 Our day camps offer a variety of activities and schedules to provide a summer full of fun and discovery for children ages 5–12, with the flexibility that busy families need. 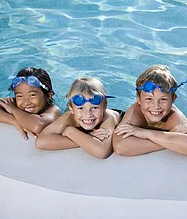 Included in your child’s weekly schedule is on-site, warm-water swimming lessons, gymnastics lessons, open gym, local field trips, library visits, arts and crafts, and more! Day camp activities run between 9:00 a.m. and 4:30 p.m., with extended hours available between 7:15 a.m. and 5:45 p.m.
We provide a positive and friendly atmosphere by focusing on individual attention, positive group interaction, and cooperation by maintaining a low camper–to–counselor ratio. Many of our camp staff have degrees in teaching and related fields, and join the Mountain Kids camp to continue working with kids during the summer. Camp counselors are CPR and First Aid certified. Mountain Kids Summer Day Camp has been licensed by the State of Colorado since 1986. We also offer an indoor winter camp during the holiday break. 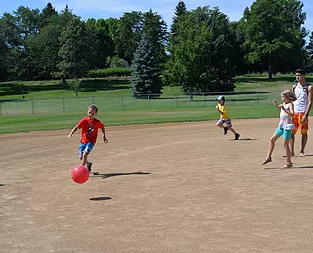 Our day camp is divided into five separate camp groups according to the grade each camper is entering in the fall: Little A (kindergarten, must be 5 when they start camp); A (1st grade); B (2nd grade); C (3rd and 4th grade); and D (5th and 6th grade). Each day camp has its own dedicated set of counselors and unique schedule to tailor activities to each age group. Space is limited, reserve your child’s spot! Camp Dates – listed below – Pick the dates that work best for you! Follow each link to view and print form. Please bring completed forms with you to register in person.